To avoid getting finger blisters, it may be a good idea to wear protective gloves. If you are going to be doing something like gardening or mowing the lawn friction can occur and over a period of time one or more blisters can develop. But friction is not the only reason people suffer from finger blisters. Blisters form as a protective barrier against your skin and the air. It acts as a band aid to protect the skin from further damage. Fluid accumulates under the skin and forms a small bubble. Usually people who get blisters try to pop them and remove the fluid. But doctors recommend that people leave the blister as is until the fluid is penetrated back into the skin. Blisters also help the damaged skin heal with out the possibility of infection. There are more than a few reasons why people get finger blisters. But perhaps the first reason is burns. It can be easy to burn a fingertip while doing things like cooking, building a fire or just lighting a candle. If you are jolted with electricity while attempting to repair something in your home, you can get finger blisters. Or if you are using a chemical without wearing plastic gloves you can also get a bad burn. These types of blisters usually only take a few days to completely heal and there is no need to see a doctor, unless the burn is chemical related. Cold has the same effect as too much heat on the skin. If your fingers are exposed to frigid conditions you may eventually get finger blisters. When people are outside enjoying a winter activity, they may ignore the signs of freezing toes or fingers until it is too late. Their hands may become frozen and numb from the cold and this is when damage can set in. Cold weather can not only produce finger blisters but frost bite can also occur. Spider bites are another reason for blisters to occur anywhere on the body, face or hands. A recluse spider for example, can leave the skin discolored and permanently scarred. A few hours after a person is bitten the area becomes reddened and swollen. As time passes painful blisters form around the bite area. In some cases the skin becomes so damaged that the upper surface may have to be removed. A recluse spider bite can take several months to fully heal. A blood blister can form on a finger as a result of it being pinched. This type of blister is exactly the same as an average blister except that the fluid under the skin is actually blood. A finger being closed in a car door or accidentally hitting a finger with a hammer can cause this type of blister. It is important not to puncture these blisters because they protect the skin from air and infection. This type of blister only takes a few days to thoroughly heal. If you have a blister you must never puncture it. Keep it clean and if need be keep a band aid on it. But if you have a blaster forming and you do not know why this occurred, you will want to make an appointment with your doctor to see why this is happening. He can make sure that you are not having an allergic reaction and go over possible medications you may be using that cause this. 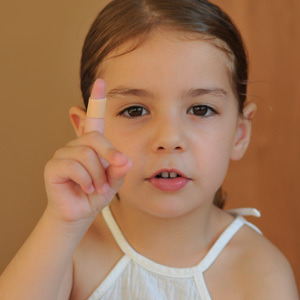 Most of the time finger blisters are easy to remedy but because they also can be caused by a damaged immune system, a quick diagnoses must be made to correct the problem.